The ultimate wrap-around desk with multiple monitor support and motorized sit-to-standing adjustment, including separate keyboard surface adjustment with tilt action. This is a premium, heavy-duty design featuring our trademark solid surfaces and Comfort Edges. 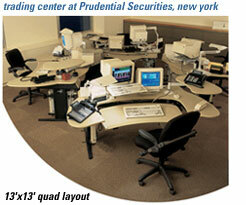 Flexible layouts for professional, executive and production applications. • Electric version has black frame with levelers. 3 grommets for wire access and add-ons. • Electric version uses standard 110v power. 5 year limited warranty. Because biomorph desks are stand- alone units and can be fully mobile, they can be re-configured at a moments notice, requiring minimal installation and virtually no maintenance. The basic biomorph models represent a starting point from which to grow a highly flexible work environment that maximizes floor space and user needs, by combining them with biomorph extension worksurfaces and storage options. Most models can be neatly placed in a corner, angled to a wall or grouped in trios or quads to facilitate flexible workgroups. No freight damage or shortage claims may be made after 7 days from receipt. No returns after 30 days from ship date. No merchandise may be returned without written consent of Ground Support Equipment (U.S.) Ltd. DBA Biomorph in the form of a return goods authorization and shipping instructions. Parts are only returnable if damaged or incorrect, otherwise a restocking fee applies as follows: Assembled desks with original packing materials – 50% of net invoice price plus round trip freight charges; Opened unassembled parts with original packing materials – 35% of net invoice price plus round trip freight charges; Unopened packaging – 25% of net invoice price plus round trip freight charges. Refunds will be made after receipt and inspection of goods in our warehouse. No merchandise is to be sent to the New York City address without prior written consent. Any unauthorized shipments will be refused and returned at the owners expense. Orders for custom and non-standard products are not cancelable. Post shipment pre-delivery cancellation incur return & restocking charges. Shipments held over 15 days incur storage charges. Original manufacturer terms & conditions apply to non-Biomorph products sold under dealership.